1 Cutting fruit and vegetables long and thin will result to a faster and efficient juicing process that will yield more juice with less pulp. 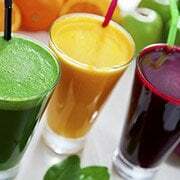 2 Slower feeding of fruit and vegetables will reult to lesser pulp and more juice. 3 A slice of lemon with skin after juicing leafy greens is recommended. (spinach, kale, celery, wheatgrass and more) Lemon will enhance the taste of any juice and will clean excess fibre in the juicer for continuous juicing, without needing to clean the juicer in between juicing. Lemon is best cut into rings with the skin. (four slices to one lemon). 4 After juicing pour a jug of water through the chute for easy self cleaning. 5 Frozen fruit and ice cannot be cold pressed by this juicer. 6 Almond nuts and Soya bean must be soaked before juicing. 30 almonds to 300ml of water will make a delicious almond milk and if you add pear it tastes even better.